In commemoration of the one hundredth anniversary of their founding, the congregation of First Lutheran Church of West Seattle commissioned David Dahl to write a celebratory anthem. That anthem, entitled “How Dear to Me is Your Dwelling,” will be published by The Sacred Music Press. Its premiere performance will be at First Lutheran Church, West Seattle, in September 2018 during a commemorative service. The finished work consists entirely of newly conceived music, inspired by the various poetic texts of the psalm and the hymn, featuring alternating accompanied and unaccompanied sections, mostly four parts. 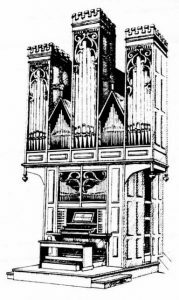 The organ accompaniment is inspired by the organ in the church–an eighteen-stop mechanical organ built by the Fritz Noack company in 1976. David Dahl is organist emeritus at Pacific Lutheran University, a member of the Tacoma Chapter of the American Guild of Organists, and a prolific composer of organ music and choir anthems.